In my lifetime of watching Everton I can remember just 2 occasions that we have travelled to Old Trafford above them in the league. The last time was in the late autumn of 2013. Few blues need reminding of the result that day, with Bryan Oviedo scoring a late winning goal for Everton in one of the best performances in the Roberto Martinez era at Everton. There are some striking similarities between then and now. Like Roberto Martinez this is Marco’s Silva’s first season and like then there has been an attempt to bed in new younger players. Alongside that game we head into Old Trafford on the back of a decent run of results while our opponents seem to suffering from an unmistakable sense crisis that looks to be waiting to consume the club. While before it was very much centred around new manager Moyes falling well below the standards set by Ferguson, it is now perhaps linked to a growing awareness that the problems facing the club go deeper than a single bad appointment. What the last 5 years have shown us, if nothing else, is that David Moyes is not singularly responsible for the falling standards of the club post the retirement of Ferguson. What is striking about our opponents on Sunday is that they have spent hundreds of millions of pounds and given successive managers copious amounts of time to find the right formula. Neither of these luxuries were awarded to Moyes, yet it is questionable how much improvement has existed since he left them, ending the season on 64 points in 7th place. There is now a legitimate debate to be had as to whether Moyes was not only treated harshly, but as to whether he could have performed more admirably had they not have sacked in 5 years ago. There is of course no easy answer to this but there are some points worth noting. Firstly it is that Moyes’s best work at Everton occurred when he was given time to implement his best ideas. Few of his best signings (Arteta, Baines, Peinaar, Cahill, Lescott & Jagielka) started quickly but all would grow into their roles as time went by. Likewise it probably took Moyes 5 years produce his best Everton teams. It was a slow, and at times turgid process. There has to be some questions asked of who appointed him if the criteria set was a manager to have a quick and immediate impact. It would also be noted that Manchester United continue to operate on a different plane to Everton, particularly the Everton Moyes inherited and this does lead to skepticism as to whether his method of operation could be generalized across clubs with vastly different expectations. If we accept the premise that Moyes was a manager reflecting continuity, evolution and a degree of cohesion and calm Mourinho reflects the opposite. Mourinho in his methods have always been unorthodox and the phrase “genius” may in this context fit. He has an approach where he looks to drive players to the edge of their physical and psychological boundaries and while often the playing style is similar to the cautious approach adopted by Moyes his man management is unorthodox and radical. Even when things have gone well for Mourinho there has always been a severe blip that would follow the success in year 3 or 4. It has now occurred too often to be more than a coincidence and would hint at Mourinho being able to drive players to the top of the mountain but inevitably fall off the cliff edge once this was done. He has yet to demonstrate he has learnt how to keep a team at the top for more than a season or two and the experience of this season will only harden his detractors views that this is a challenge that is beyond him. For the most part I think Manchester United accepted this dichotomy. After 3 barren years post Ferguson, they looked happy to embrace a figure very much at odds with the team building method’s employed by Ferguson in exchange for a League title. While Mourinho has delivered silverware, his inability to deliver the league will be held against him and seeing city rivals Manchester City looking to produce a dynasty of their own makes the impending fall from grace harder to swallow. All of the above context creates a football club in the midst of their own existential crisis. This is now filtering onto the pitch, where some very talented players are significantly underperforming. For Everton it presents a unique opportunity to begin to put right a psychological black hole that exists within the club-namely an inability to win away from home at sides towards the top end of the league. While all games of football are for 3 points there can be no doubt that not all 3 points are equal to managers, players and supporters in trying to build the sort of momentum that gives stakeholders the confidence that wonderful achievements can be made. 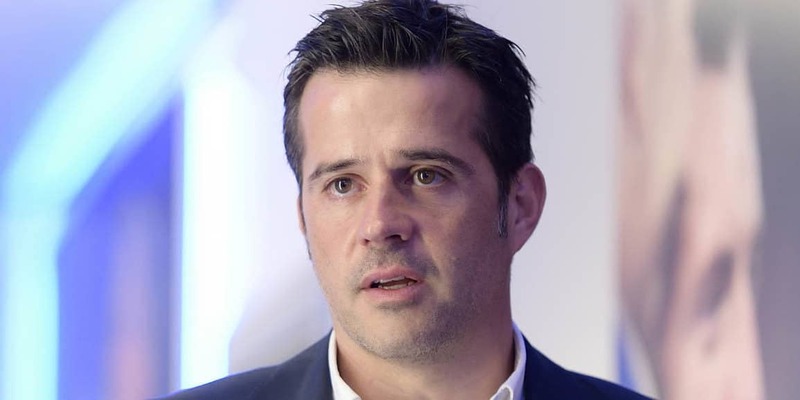 For manager Silva, who himself has made an impressive start to his managerial career, a win at Old Trafford would have a profound impact for both the club and for his role as manager, in all likelihood elevating him to a hero status very early into his tenure. There will of course be cynics who will point out this is not your typical Manchester United team. They are right. Yet I don’t think this makes an enormous difference in the eyes of fans. A big frustration for Everton fans is not just that we haven’t won against top teams away from home, but that there have been opportunities that have presented themselves for Everton to win in such fixtures and for the most part they have been wasted. I believe most Everton fans are intelligent enough to know that if a top team is playing well it will be uncommon for Everton to win (though not as uncommon as it has been!) but in the moments where we have arrived at such teams in better form, playing more confidently the team have too often frozen and not got over the line to win games. For Silva to send an Everton team out who are better balanced than their Mancunian opponents as well as in better form and get over the line with a win would be an enormous statement and help tackle the unease supporters feel around such fixtures. You also feel, looking at Silva he needs a big result over the forthcoming period to really cement his arrival and ideally the arrival of Everton as a team who seriously intend to compete for honours. For Joe Royle’s Everton seeing us play well and win at Highbury and Anfield in quick succession cemented in the players, supporters and wider media that Everton were a force to be reckoned with. Likewise for Moyes he had the infamous “remember the name Wayne Rooney” game against undefeated champions Arsenal. A significant early win will make an enormous difference, and Sunday’s match presents Silva with a big opportunity to stamp his own mark onto the football club.